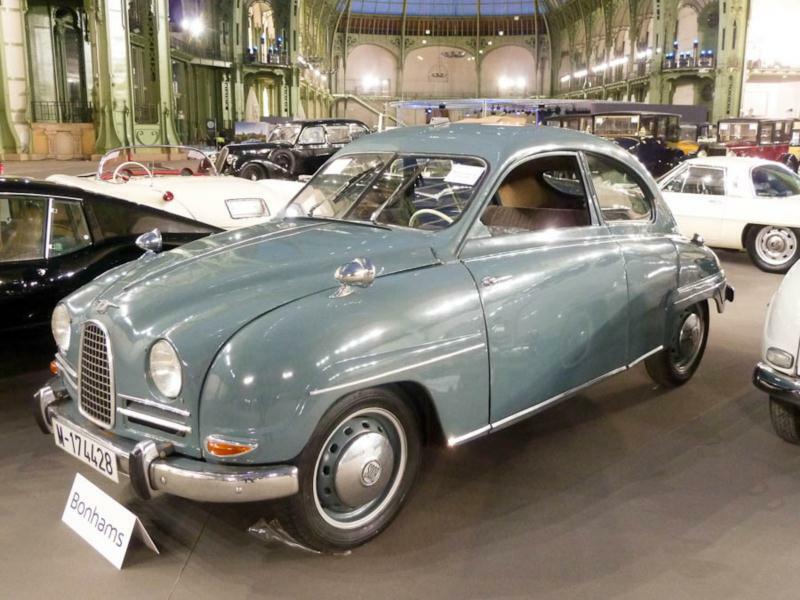 Saab made its first prototype car in 1946 and went into full production late in 1949 with the model 92. Although the little car from Sweden didn’t make a huge impact right away, it featured several design characteristics that placed it firmly ahead of its time and would continue to characterize Saab automobiles for decades. The Saab 92 featured unibody construction, and combined a fastback sports coupe look with ample interior space for four adults. Doors opened from the rear, and to save money the company did not include a separate opening trunk lid in the rear. The unibody construction helped keep the 92 light at just 1,680 pounds, which allowed it to use a two-cylinder two-stroke engine. The engine in the Saab 92 was an inline two-cylinder design, displacing 764 cc and developing 25 hp. The engine allowed a top speed of about 65 mph. Because it was a two-stroke, the driver was required to mix his own two-stroke oil into the fuel. The new Saab was also unusual as a front-wheel-drive design, with a three-speed manual transmission featuring synchronizers on second and third gear. Suspension was by torsion bar on all four wheels, and the 92 featured rack and pinion steering and four-wheel hydraulic drum brakes. The Saab 92 was known for its tendency to oversteer, which made it a popular rally car in the day, even competing in the exclusive Monte Carlo Rally. Just 1,246 examples of the model 92 were made in 1950, but production soon ramped up to 2,179 in 1951 and 2,298 in 1952. A new revision called the 92B came along in 1953, with a functioning trunk lid and a larger rear window. Saab made 3,424 examples of the 1953 model 92B. The company continued production of the 92B through 1954 and 1955 with horsepower increased to 28 but otherwise essentially unchanged, with 5,138 cars made in 1954 and 5,620 in 1955. Production of the 92B went on into 1956, with a final 680 cars produced in that year. 1956 was also the year that the new Saab 93 was introduced. The 93 was evolutionary rather than revolutionary, featuring a new three-cylinder two-stroke engine, displacing just 748 cc but boosting horsepower to 37.5 and torque to 52.1 lb-ft. The suspension now used coil springs at all corners, though the rear design used a U-shaped rear axle that was not independent. The 93 boasted a top speed of 70 mph and 0-60 acceleration of 24.9 seconds. The car delivered up to 37 mpg. One notable feature of the 93 is that the front seats folded flat to provide sleeping space for two. Interior upholstery came in cloth or plastic with cloth inserts. Production of the 93 included 5,640 cars in 1956 and 9,487 cars in 1957. 1957 was the last year of production for the 93, which was to be succeeded by the 93B in 1958. But the 93 appeared for the first time in America at the New York Auto Show in May of 1956, and the first shipment of cars arrived in the U.S. later that year. About 1,400 Saabs were sold in America in 1957, and Saab established its first U.S. offices in the same year.